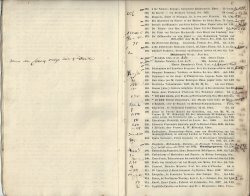 Manuscript volume titled 'The Life and Adventures of Walter Venning Southgate, by his Father [the London auctioneer Henry Southgate].' 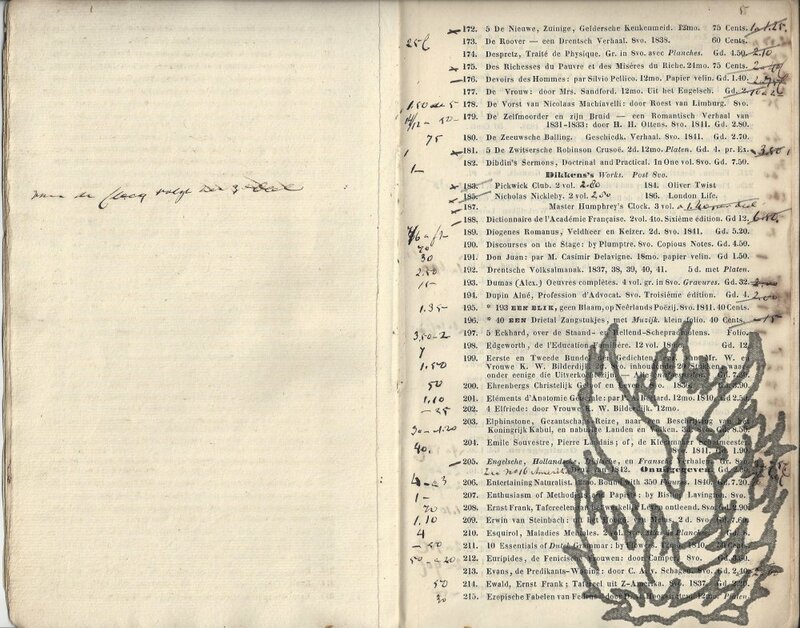 Containing original manuscript letters, drawings, engravings and other material. Manuscript title date 'London. MDCCCXLIV ', but containing material from between 1844 and 1883. Folio, 110 pp, comprising [i] + 68 + [ii] + 39 pp. Handsome volume in slipcase, tight and internally in very good condition, on lightly-aged thick Whatman paper. Well bound in black leather morocco, all edges gilt. Binding blind-tooled and with 'Early Days' and 'W. V. S.' in gilt on spine and motto on front board: 'Nourish the sentiments thy principles approve and put thy trust and confidence in God.' Binding worn and rebacked, in worn black cloth slipcase. Gedruky bij M. & F.C. Westerman, O.Z. Achterburgwal te Amsterdam. 1842 (in roman numerals). Total 48pp, 8vo, including alternate blanks for notes,with handwritten information about prices, etc. (seller's marked copy presumably), marbled wraps, worn, contents sl. worn at edges but complete, with ill-defined stamps at beginning and end (one has phrase Noord Holland). REST Of title-page: "Op Zaturday den XVIII Junij 1842, | zullen Nayler & Co. met hunne | Ongebonden- Verkooping | een aanvang maken, | in het Logement DE ZON, op Nieuwen-Dijk, No. 234, | te Amsterdam [...] Uren van Verkoop: | 9 tot 12 - 1 tot 4 - 6 tot 10 - met Klokstage. [George Robins, auctioneer.] Autograph Letter Signed ('Geo Robins') to the editor of the Morning Chronicle James Black, pushing for an article to be inserted in the paper, to tie in with his sale of the contents of Horace Walpole's Strawberry Hill. 'Covent Garden [London] | Friday '. 2pp., 12mo, bifolium. Very good, on lightly aged paper. The letter reads: 'Strawberry Hill is to the classic world much more important than the turmoil of everlasting Politics. It will be a little refreshing as a contrast to your readers to hear of Horace Walpole - the Inclosed is from Gallignani's Journal[.] in Paris they give a better attention to the Arts as well as the nuisance of everlasting Politics'. Postscript reads: 'Would you like to have a card to see'. Autograph Letter Signed ('Danl Terry') from the actor and playwright Daniel Terry to the Liverpool auctioneer Thomas Winstanley, attempting a reconciliation in their friendship, and referring to the London auctioneer Samuel Oxenham. Undated [on paper watermarked 1820]. 2pp., 12mo. 22 lines. Watermark: 'J GREEN | 1820'. Bifolium, with the reverse of the second leaf addressed by Terry to 'T Winstanley Esq'. Fair, on aged and lightly-creased paper, with closed tear to top half of fold. The letter begins: 'For God's sake - for the sake of auld lang syne - dine with me to-morrow.' He asks Winstanley to overlook his 'long silence & apparent neglect', it having been 'busy world [sic]' with them both since they last communicated. He assures him that he is 'the same as ever in affection & respect'. Auction Catalogue of the sale of a textile collection, a Mercer's Stock. 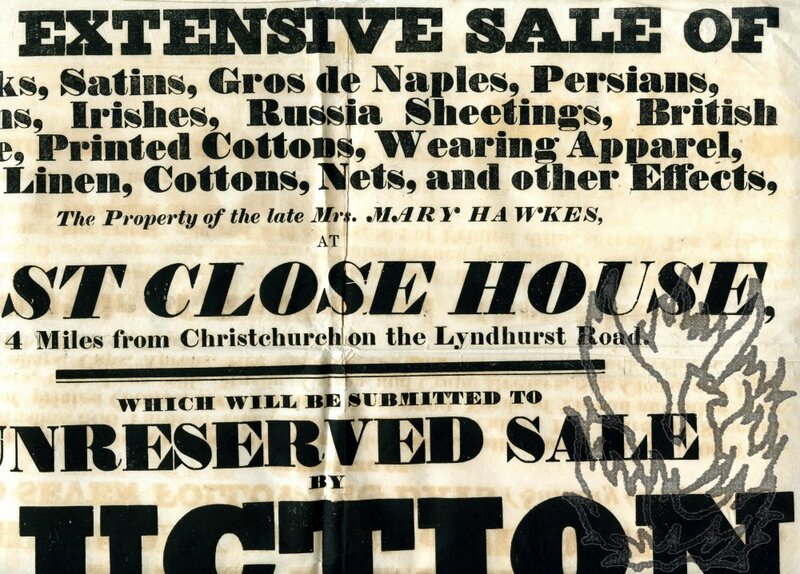 Items relating to Mary Hawkes (d.1834) of East Close House, Christchurch, Hampshire, including an auction catalogue of the sale of the textile stock of a member of the Levett family of mercers, a poster for the same auction, and a copy of Mrs Hawkes's willAn interesting collection of material. Catalogues of textiles auctions are extremely uncommon for this period, and a significant one, priced in manuscript like Item Two, with associated material placing it in context, must be all but unique. Kirby, Essex. Catalogue of Live and Dead Farming Stock and Household Furniture, to be sold by auction. 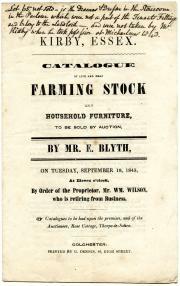 By Mr. E. Blyth, on Tuesday, September 19, 1843, At Eleven o'clock, By Order of the Proprietor, Mr. Wm. Wilson, who is retiring from Business. 1843. Colchester: Printed by G. Dennis, 40, High Street. 12mo: 8 pp (a 43 x 27 cm leaf, printed on both sides and folded twice to make four unopened leaves). Pamphlet. Text clear and complete on lightly-aged and spotted paper. 'Conditions of Sale' on reverse of title. 170 lots, with lots 48 to 68 priced and named by the auctioneer, who gives the total as £4 9s 6d, with 'Commission & Exps.' of £0 8s 6d. Interesting manuscript note at head of title: 'Lot 65 not sold - is the Drawers & Dresser in the Storeroom in the Parlour which were not a part of the Tenants Fittings and belong to the Landlord - and were not taken by Mr.
7-inch extended play 45 rpm vinyl record entitled 'Tobacco Chant - Part 1 | The Song of the Auctioneer' ['Tobacco Chant - Part 2' on the b-side]. Tobacco Auctions Limited, Salisbury, Southern Rhodesia. Undated. Dusty, but veryy good, on black vinyl with yellow label and triangular insert. In lightly worn, creased and grubby original sleeve printed in green and yellow, carrying a lengthy note by G. J. Ashton, beginning 'On this record you can hear parts of an actual sale of tobacco held on the floor of Tobacco Auctions Ltd., Salisbury, introduced by BOB CAGE. Mr. Cage, a native of Halifax, Virginia, has been auctioneering tobacco for over fifteen years in the United States and Rhodesia. Landscape 8vo: 10 pp. On the first six leaves of a twenty leaf stitched account book, on blue ruled blue paper, in original buff wraps. Printed label on front cover reading 'SALE BOOK. | Sold by HUDSON SCOTT, | Stationer and Account Book Manufacturer, Carlisle.' 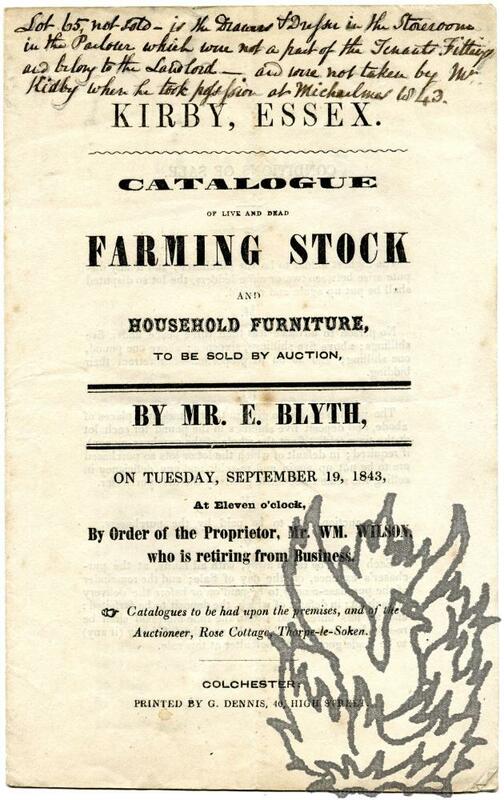 Manuscript title on front cover reads 'Sale a/c of J. Sagar under Bill of Sale to Mr. Stubbs 1856.' and 'Effects of John Sagar, Ironmonger Botchergate under Bill of Sale to Mr. Stubbs. - Jany. 23. 1856.-' Internally clean, in grubby wraps. 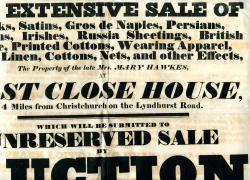 Description of sale, on first page, signed 'William Browne | Auctioneer'. Autograph Letter Signed ('S. Leigh Sotheby') to 'W. Carpenter Esq'. 5 January 1849; Woodlands, Norwood. 12mo, 4 pp, 38 lines. He is sorry to have forgotten to return 'the works you most kindly lent me in respect to the early Brussels wood-engraving'. They had been 'taken into town' to be sent to Carpenter, but 'in the turning out of all my books from the counting house at the time of the alterations, these were with my other matters taken into a room in Lancaster Place'. He apologises for his 'apparent negligence', but until he puts his 'new room' in order he cannot 'get at these said Pamphlets'. Autograph Letter Signed ('John Freeman'), with envelope, to Hodgson at 20 Bromley Common, Bromley, Kent. 7 April [no year]; on embossed letterhead of 29 Weighton Road, Anerley, [London,] S.E. 8vo: 1 p. 7 lines. Good, but with some foxing, and with a corner of the blank reverse tipped in onto a card mount on which the envelope is laid down. He thanks him 'for the catalogue containing the Moore item'. Would be 'very glad' if Hodgson 'could call here on Thursday next & join us in a meal at 7 o'clock [...] I suggest Thursday because then we shall not be alone, nor dull'. Hodgson was the author, in 1927, of 'Brief notes on the history of the hamlet of Penge with Anerley'. Autograph Letter Signed ('S. Leigh Sotheby') to unnamed male correspondent. Three pages, 12mo. On aged paper, with a few closed tears and rust marking to blank verso of second leaf of bifolium. He thanks him for sending the books for examination. 'Mrs. Sotheby will take a photograph of the phiz of Peter Schoeffer, But as to the woodcut being of that I do not at present believe it - | The letters & papers are not of the time.' He asks him to translate a passage, comments further on Schoeffer, and asks if his correspondent has 'any new of Paper Factory for me.' Concludes 'Write me the full particulars of what Dutch Collection in the library of Sir Ths. Autograph Signatures on fragment of petition. Without date or place, but on paper watermarked 1831. Three noted British painters of the first half of the nineteenth century: Clint (1770-1854), Stanfield (1793-1867), Brockedon (1787-1854), together with the printseller Colnaghi (1790-1879) and the auctioneer Robins (1778-1847). Paper dimensions roughly five inches by four inches. Good, but lightly creased and a touch grubby. From a collection of material relating to the Artists' General Benevolent Fund.